As the New Year beckons, it’s time to speculate about what 2016 holds. Here are nine predictions. Talent management will be a much bigger issue. In Temenos’ annual banking survey, double the number of bankers compared to last year told us that attracting and retaining the right talent was their biggest priority. And it is in technology that the issue is most acute. Banking has become a relatively less attractive place to work at the same time as facing increased competition with all industries for the same kinds of scarce profiles, such as the best data scientists. The technology talent deficit runs across the whole organisation, with Accenture recently highlighting that banks’ boards have very few executives with professional technology experience. From roboadvisor to bionic advisor. We believe that in 2016 the industry will pivot to talking more about the bionic advisor than the roboadvisor. In 2015, the industry became very excited about roboadvisors: automated, algorithm-based portfolio management services. As a means to reduce fees and democratise asset management, roboadvisors represent a major structural shift. However, combining roboadvisors with professional asset managers represents an opportunity to do the same, but with better performance – the algorithm makes the selections but is guided by an asset manager’s informed convictions. Still not the year for the cloud… We stick by our prediction that, by 2020, all new core banking replacements will be in the cloud. Banks won’t have any choice. Firstly, the economics of banking is changing and this will force banks to share infrastructure costs. Secondly, if banks are to keep data secure, they will need to cede this responsibility to datacentre providers like Microsoft which have the resources and scale to invest in staying ahead of cybercriminals. Lastly, to cope with the massive rise in interactions resulting from the move to mobile and the Internet of Things, banks will need the scale provided by the cloud. That said, our data suggests that in 2016 at least we are unlikely to see a step change in the number of banks running core processing in the cloud. From competition to collaboration. The benefits of collaborationbetween banks and fintechs will become increasingly clear for both sides. On the one hand, fintechs are small, nimble and innovative. On the other, banks have customer trust, large distribution networks and large balance sheets. Collaboration between banks and fintechs is therefore a win-win, improving the former’s capacity for innovation and giving the latter scale, credibility and route to market. In 2016 we expect to see many more of these types of partnerships, like the recent one between JP Morgan and OnDeck, with banks integrating fintech products and services into their customer offering. Open banking will become mainstream. We expect to see more of a move to open banking, where banks use APIs to open up data and resources to third-parties. On one level, this is will be technical integration, or “fintegration”, of fintech services, the latter interfacing directly to bank customers (rather than through, say, referrals). But, it is a broader phenomenon which will speed up the separation between the distribution and manufacturing of banking products. Banks will need to make a call about where they sit in the banking value chain: distribution platforms or resource platforms. Unlike fintechs, they don’t have the cost structure to be single product manufacturers. As our banking survey highlighted, the majority of banks see open banking as essential to competing against technology players like Google. But few see it a major priority today. We think that will change in 2016 as competition hots up, and with advance of regulations like PSDII. The battle for the customer. In 2016, the fight to control banking product distribution will intensify. This will happen as more progressive banks transform themselves into sales platforms offering own labelled and white labelled products, as comparison sites and aggregators originate sales directly on bank platforms, and as the full extent of GAFA’s ambitions to go beyond payments and into distributing financial services becomes apparent. From credit to debit. In an effort to avoid large merchant fees on credit card transactions, which are actually much higher for online than offline transactions given higher risk and the need for a gateway, we predict a move to debit card payments or direct bank transfers. In places like the UK and Singapore with near real-time payments, we predict that SME merchants will lead a movement towards debit card transactions settled through the faster payment network (PayM in the UK), thus avoiding merchant fees but without taking on any credit risk. In the US, we think that this will take the form of direct bank debits using the NACHA scheme that enables consumers to easily make online purchases and bill payments through the ACH by using their online-banking credentials. Big rises in IT spending – and changes in how it is measured. The metrics we track all point to significantly higher IT spend in 2016, especially in areas like core banking, analytics and channels, which will be needed if banks are to deliver customer intimacy at scale. We also think that banks will look at IT spend differently, moving away from measures like IT spend/total costs, which become increasingly redundant in a world of higher automation and fewer branches. Instead, we believe focus will shift to different measures such as the share of IT directed to innovation compared to maintenance, and the split of front vs. back office spending. Last night, we were very privileged to hear a talk from Hervé Bourlard, an EPFL Professor who is also Director of the Idiap, a research institute based in Martigny in Valais. That it took Hervé more than an hour to present his four intro slides on Idiap underlines clearly the level of interest in its cutting-edge research. IP – Hervé also opined on the thorny subject of IP rights. Generally an advocate of openness, Hervé has been moved in recent years to write tighter contracts and seek additional patents as the institute tries to generate more revenue from the breakthroughs it makes. Somewhat reluctantly, Hervé also agreed with the premise of work from economists like Mariana Mazzucato that private companies appropriate unfair rents on many public goods, including academic research. Money – Hervé’s chief learning and his most important advice to others is to “follow the money”. Obtaining funding is hard, but it is self-evidently essential to workings of any institute and lab and it must remain top of mind at all times. Hervé waxed cautious on the Europe’s prospects for innovation and future prosperity. While, he argues, academic research is better in the Europe than the rest of the world, Europe has a poor record of commercial exploitation. Speech processing – a beacon of hope? I recently took part in a panel discussion at the University of Geneva. The topic was “Will digitalization be disruptive or constructive to the Swiss financial industry?” My view, as set out below and framed using some of the questions asked to the panel, is that fintech should be a highly beneficial movement for banks – provided banks embrace it. If banks are open to cultural and technological change and prepared actively to collaborate with the fintech community, then they can capitalise to deliver much better customer outcomes. Fintech is an umbrella term used to describe the fast-expanding group of companies that are trying to use technology to deliver superior financial products and services. For the purposes of this discussion, we’ll limit the word “fintechs” to start-ups and challenger banks, although it could be applied more broadly. The fintech movement is getting a lot of attention for two main reasons. Firstly, because – rightly – many people see that digitization of the banking industry opens it up to new competitors and business models. Secondly, the sector is attracting a great deal of investment. According to CB Insights, the sector has attracted almost USD14bn of corporate and VC money over the last 12 months. This represents year-on-year growth of about 40%. There are now more than 12,000 fintechs operating around the world. Are fintechs disrupting incumbent banks? I’ll probably get lots of negative comments for saying this, but the fact is that fintechs have so far failed to land any really major blows. There are 25 fintech unicorns according to Business Insider. If you look through the list, these are still far from household names and the scale of their operations is still immaterial in the markets in which they operate – I calculate, for example, that TransferWise has a 0.0003% share of global daily FX volumes. And in many cases the fintechs, rather than disrupt the status quo, actually serve to extend and reinforce it. Take Square, which is basically aimed at increasing merchant adoption of credit card payments. This is not to trivialise or minimise what fintechs have achieved. Fintech start-ups are making big progress in reducing friction and lowering the cost of banking services, to the benefit of society in general. The two start-ups which spoke on the panel with me, True Wealth and Fundbase, are doing great work in democratizing wealth management, allowing the general public access to funds and portfolio management services that were once the sole preserve of the very rich. But, having said that, neither has yet achieved widescale adoption, and it would – for now – be relatively easy for banks to partner, build or buy similar capabilities.BlackRock recently did just that with its acquisition of FutureAdvisor. Goldman Sachs, meanwhile, is creating its own marketplace lending platform. Growth – the successful companies are growing very quickly. Lending Club, one of the few listed fintechs, is guiding for revenue growth this year of about 90%. Clearly, it won’t take many years of compounded growth at these levels for the company to generate meaningful market share. Expanding value prop – until now, fintechs have focused chiefly on providing discrete services. But, it is becoming increasingly clear that their ambitions don’t stop there. Take Prosper’s recent acquisition of BillGuard. This shows a clear intention to offer additional, value-added services to its customers: a cross-sell opportunity as well as a way to differentiate in a commoditized market. Moving beyond payments and loans – we see the reach of fintechs going beyond payments and loans into other, often more heavily-regulated, parts of banking such as trading, trade finance, current accounts, capital raising and risk management. Moving further into the middle- and back-office – as well as expanding horizontally, there is increasing evidence of fintechs delving deeper into the vertical stack. There are lots of fintechs working in areas such as virtual exchanges, alternative due diligence, market information as well as the blockchain. Given all of the above, it is possible that in time we could see the emergence of alternative financial ecosystems consisting entirely of alternative players, which would not rely on banks. Can’t banks use regulation to protect themselves? The rationale for this question is basically as follows: regulation has been a highly effective barrier to entry in the past and since banks can influence the regulator, they should lobby to protect themselves from further market share erosion. In this context, it is interesting to see the growing number of calls from banks such as HSBC and Santander for tougher regulation of alternative players. And, indeed, there does seem to be some movement on the part of the regulators, such as their investigation into the P2P market. However, so much of regulatory activity is actually moving in the other direction, towards lowering entry barriers and opening up competition. Consider the European Commission’s moves on MFID II, capping interchange fees or PSD II, the last having potentially massive implications in terms of neutralising one of banks’ biggest sources of competitive advantage by making customer transactional data available to third parties. Also, even if it were possible to use regulation to bolster protection in the short term, it is doubtful whether such an approach is sustainable. The music industry’s experience with getting Napster shut down would be suitable warning. It didn’t stop the way people wanted to consume music: they first gravitated to iTunes, and in the process turned Apple into the world’s largest music distributor, and then moved on to widespread music streaming. The fact is that change is inevitable, and banks must embrace it. On the one hand, fintechs are small, nimble and innovative. On the other, banks have large distribution networks and large balance sheets. Collaboration between banks and fintechs is therefore a win-win, improving the former’s capacity for innovation and giving the latter scale and route to market. This is why initiatives such as bank-sponsored accelerators, open APIs and app stores represent great opportunities. They are likely to increase in popularity. Collaboration between banks is also important to build the standards that will allow for many new technologies to be exploited commercially. Take the Blockchain, for example, which everyone is talking about: it will generate significant value only if banks are able to agree on the use cases and a set of common protocols. This why recent announcements, such as the 22 banks which have agreed to work together on R3’s distributed ledger initiative, are so important. As all industries digitize, the pinch point in the value chain always becomes distribution; a battle to control the point of customer interaction. It seems much more likely that it will be the tech giants, such as Apple or Amazon, as opposed to fintechs, who have the potential to control the distribution of banking products. They already have a deep reach into consumers’ lives. And their advancement into banking is already seen. Apple Pay and Android Pay are clear strategic plays for Google and Apple to become gateways into financial services, while also enabling them to gather more transactional data. This is why it is so strange to see so many banks advertising Apple Pay. I suppose the analogy is of the victim inviting the killer into their home. For if banks lose the customer interaction, they’ll be reduced to product manufacturers, competing against fintechs – but with substantially higher cost bases. How do banks hold on to distribution? Not all is lost for banks. They still have many competitive advantages. Consumers still trust banks more than other providers to safeguard their assets. Banks can offer integrated services. And banks have access to customer transactional data. What banks need to do is to turn themselves into trusted virtual advisors. Practically, this will mean drawing insights from customers’ transactional, contextual and locational data, and serving them up in the form of expert advice, opportunities to save money and product recommendations they actually need. It will also mean opening a marketplace for banking and non-banking services, where fintechs supply many of the banking products. There is definitely a danger around complacency. The IT re-platforming required to become true digital banks is also a challenge, but clearly a surmountable one. The biggest challenge is cultural. Too few banks are mining their customer data. Too few banks appreciate that to keep distribution will mean giving away many existing services to competitors. And too few banks are collaborating with fintechs, recognising the friend they could become. It implies that interesting times disrupt the rhythm of life, bringing hardship and difficulty. It would be a considerable understatement to say that the past eight years since the financial crisis began have been interesting for the financial services sector – and they have certainly been hard and difficult. But out of this are emerging some incredible opportunities to change the way things are done; life really is about to get interesting in a good way for financial services and in the financial technology sector in particular. Fusion, Switzerland’s first fintech start-up accelerator which was set up by venture capital company Polytech Ventures in February this year, has just completed its first selection process. From a field of more than 100 applicants, we have chosen 10 of the best ideas from across the world to move to Geneva for 12 months. They will be coached, mentored and supported by some of the world’s finest academics, bankers, IT professionals, entrepreneurs and businessmen. The sheer size of the field amazed us – we were hoping for 50 applicants in our first year – and the standard was truly incredible, reinforcing our view that there are some fantastic ideas out there to address issues facing the financial services sector. It also makes it clear that what we are offering is highly valued by the start-up community. Fusion is different from other accelerators. Rather than the typical 1-3 months’ support to help refine the start-ups’ business models and prepare a pitch for investors, we introduce them to companies in their field for marketing, software development, and legal and help them find routes to market. In return, we don’t charge a fee nor do we take an equity stake, rather we levy a commission on any funding they receive during a 24-month period. Finally, we are offering and encourage a collaborative approach with our partners and other participants in the incubator, anchored in our belief that fintech is a movement to complement and enrich the existing industry. We believe our model will deliver a substantially higher chance of success than the usual incubator as we offer a far longer, deeper and more rigorous preparation for market. Start-ups fail not because they don’t have good products, but because they lack core business skills to overcome the barriers to entry. They have great ideas, but lack sales and marketing, management or sales support skills. We will help with all that and refine their go-to-market plan. Our corporate members, who act as mentors, are drawn from right across financial services including banking, wealth management, insurance and commodity trading. We have academic partnerships with some of the world’s top engineering schools and research institutes, and venture capital support to syndicate funding. What’s needed now is support from the Swiss authorities. One of the conditions for entering the incubator is that the company moves to Switzerland. While Switzerland is undoubtedly beautiful, well connected, centrally located and full of financial sector expertise, it is also expensive and most entrants need visas. While we have selected companies from Switzerland, we have also invited companies from the UK, Poland, Romania, China, the Netherlands, Singapore and Argentina to participate in our programme. Other countries such as the UK have realised the importance of encouraging innovative start-ups and offer tax breaks, help with visas, accommodation, public relations and even easy relocation finance. Similar assistance in Switzerland would be a huge benefit, not only for the start-ups but for the country itself, which is having to reinvent itself as a financial centre after losing its banking USP of secrecy. Banking remains a key sector for the Swiss economy, contributing 10.5% to Swiss GDP, compared with 6.8% for the UK. It employs 5.8% of the workforce. But the sector is undoubtedly under threat and the government needs to look for ways to reinvigorate it. Creating a successful fintech hub that distinguishes itself from others in the world would go a long way towards that. There has already been success with medtech, which last year contributed more in terms of GDP to the Swiss economy than in any other country – 2.3% of GDP or SWFr14bn, according to Medical-cluster.com and SMTI. Similar attention to the fintech sector would see it develop into an equally important sector, particularly if it encourages focus in areas where the Swiss already lead the world: commodities, wealth management, insurance, unstructured data and core banking. We would also like to see the government encourage a more vibrant venture capital environment that embraces a collaborative approach. Switzerland has lots of available finance, but rarely does it make its way to the start-up community. If the government were to force Swiss pension funds to invest just a tiny proportion of their wealth in venture capital we would see a huge boost. A 2% switch would see $16bn made available for VC investment. Such assistance would help develop a distinct ecosystem where start-ups thrive. As experience grows and more knowledge is acquired, more start-ups will arrive, expanding experience and knowledge, creating a virtuous circle. Investing in fintech now is a hedge against the future. The current Swiss banking model is in decline despite being a world centre and having leading academics and research. Concentrating on developing fintech excellence would create a whole new industry for the country based on what it already excels at. We are really excited about Fusion and the futures of the 10 companies in our first intake. The next year will be hugely interesting – and in a good, positive way. Temenos reported very strong Q2 results: total software licences were 56% higher than a year ago (15% excluding acquisitions and FX). The results reflect a lot of Temenos-specific factors, such as the successful development of the market in the US, where Temenos had two very strategic deals in the quarter, and continual market share growth in Europe and the Middle East. The IBS League Table showed volume growth for the first time in 2014. Every year, International Banking Systems (IBS) publishes a league table of core banking system sales. This captures all system sales to new-name customers. In 2014, it showed the first volume growth in the market since 2007 (i.e. pre-crisis). However, the volume growth was very slight (3 more systems were sold in 2014 than in 2013), so it was difficult really to define 2014 as a turning point. But, the growth by value in 2014 was much more significant. Each year, we carry out an exercise to reconstruct the IBS League Table, using a variety of sources to fill in the gaps in the IBS dataset and build a complete picture of our market. Essentially, we arrive at an almost full view of which vendor won which deals in which countries and for what value. The result of that exercise showed around a 5% growth in value of sales made to new name customers compared to a 2% growth in volume. We may also be witnessing the start of a break down in the historically very strong correlation between bank RoE and core banking sales. That is to say, core banking replacement is potentially moving from a pro-cyclical activity (one which banks undertake when times are good) to one that is more strategic/structural (and, thus, less correlated with the economic cycle). Why is the market growing again? Unsustainability of existing systems and the opportunity cost. Maintaining existing legacy systems, which most developed market banks still run, consumes three-quarters of IT budgets, crowding-out investment in IT enhancements. Further, these legacy systems are not fit for purpose: complex and not able to cope with the demands of digital banking and increasingly at risk of failure. A growing appreciation of the importance of technology in creating competitive advantage. As banking digitizes (moves online) and as payments dematerialize (move away from cash), banks will continue to reduce their physical presence and their staff numbers and IT will become a bigger proportion of expenditure and bigger source of differentiation (in areas such as efficiency and risk management for sure, but also most importantly in terms of customer experience). It is interesting to note that, after a first big round of CEO changes following the credit crisis (where banks appointed CEOs to cut costs, shrink risk-weighted assets and generally restore investor confidence) we now seem to be seeing a second wave of CEO changes. A new breed of CEO (digitally savvy, alive to changing customer behaviour and the changing competitive threat, and not necessarily drawn from the banking industry) seems to be coming to the fore to shift focus towards digitization – executives like Ernest Leung at BNP Paribas Wealth Management, Tidjane Thiam at Credit Suisse and David McKay at RBC. For the sake of the core banking industry, which has weathered several difficult years, I hope that the current trend is sustained. But, more importantly, I hope so for the sake of the banking industry. As we argued in a recent paper, the banking industry is at a turning point. While banks will always be necessary, their roles in our lives could become seriously diminished if they do not embrace what we term “experience-driven banking” (essentially, acting as an infomediary to give value-added advice and recommendations). If this happens, the nature, importance and profitability of the industry will shrink unrecognisably from where it is today. When I spoke at the Goldman Sachs financial services conference last Wednesday, we got into a good discussion about how little insight investors are given into bank IT spending (one audience member described it as a “black box”). Given that IT today represents around 15% of costs at a typical universal bank and given the growing importance of technology to building and maintaining competitive advantage in an increasingly digitized industry, this situation must change. Investors and other bank stakeholders should be demanding more disclosure on where the money goes as well as banks’ strategy and roadmap for the future. Until that happens, however, investors will have to build for themselves a picture of banks’ IT capabilities and their readiness to take advantage (or withstand) exponential technology change, rapidly changing customer behaviour and a new competitive environment. 1. How much does the bank spend on IT annually? A bit of an obvious one, but it’s not disclosed today and is an essential starting point. 2. What is the bank’s ratio of maintenance spend to enhancements? 3. What is the ratio of IT and back office staff to total employees? This will give a measure of how efficient the bank’s back office processing is and, by extension, an idea of the split between spend on transaction processing and other back office capabilities vs. everything else (which is more likely to result in better customer experiences)? 4. What percentage of transactions are straight through (i.e. don’t involve any human intervention)? 5. How many services are not only straight through but also real time? STP just eliminates human intervention, it does not stop services being provided through bulk/batch – i.e. collated throughout the day and processed in one go, typically overnight. Since in most countries, clearing and processing is not real-time, not all services can be real-time. But banks will need real-time capabilities to deliver the rich online experience we envisage they’ll have to offer to stay relevant (see below). Banks should simultaneously be building real-time capabilities across all services and lobbying for single immediate payments in their domestic markets. 6. What is the bank’s strategy for leveraging its data to better service, cross-sell and retain its customers? 7. What is the strategy for open banking (creating an online marketplace offering both the bank’s and third party products)? The banking value chain is splitting: new players are offering discrete services (e.g. TransferWise for FX, Lending Club for unsecured credit) and non-banks are trying to offer front-end capabilities that threaten to disintermediate the banks. To successfully compete, banks will need to become more open. They’ll need to offer third-party banking services (e.g FX, remittances) where these are cheaper or offer better convenience as well as third-party non-banking services like legal services if they are to ensure that they remain customers’ principal gateway into banking. 8. How agile is the bank in terms of speed to launch new products and apps? This will give an indication of how responsive a bank can be to fast-changing competition. How quickly can it launch a new product? How quickly can it launch an app? 9. How is the bank fostering innovation? (e.g. involvement with start-ups)? Developing an innovative culture will be key for banks to generate new ideas and accelerate the pace at which they are able to bring these to fruition. The most innovative companies are those that cast the widest net for ideas. Is the bank involved with the start-up community? Does it run hackathons? Does it crowdsource innovation? Does it open up its platform to third-party developers? When it is incubating innovative ideas, can the teams involved operate with different conditions (e.g. more autonomy, fewer KPIs)? 10. How is the bank preparing for the explosion of interactions with increasing digitization and the internet of things? Barclays, since it introduced its highly successful mobile banking app Pingit, has seen the number of interactions rise from roughly 2 per month to more than 30 per month. This phenomenon has been observed in other industries such as travel and book retailing, but is likely to grow exponentially as more and more devices connect to the internet (e.g a smart printer will order its own ink, querying your bank account). Are banks ready for this explosion in look-to-book (i.e. number of times customers access their accounts in a given time period without necessarily executing any transaction), which requires bank to operate at a different scale and also to drive down costs (since the extra interactions likely come with no commensurate increase in income)? 11. Are there any services that can’t be delivered through all channels? That is not to say that all services have to be available on all channels, but that any service can be delivered on all channels and all channels can distribute any service. GAFA (Google, Apple, Facebook, Amazon) have this capacity today. 12. What is the strategy for managing online security, mitigating risk and potential associated reputational damage? Our banking relationships are moving online and banks are gathering and analysing more information about us, which needs to kept secure. 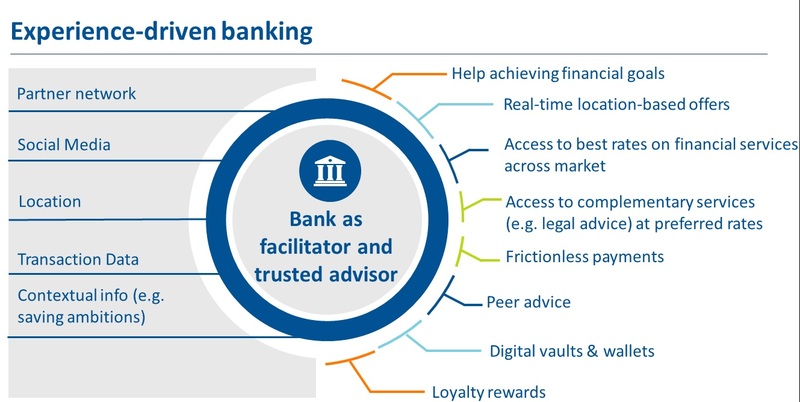 Our view is that the only way banks prevent themselves from disintermediated over the medium term is by offering what we term experience-driven banking (and which we have tried to depict in the graphic below). To deliver this will require positive responses to all of the questions above. Is software eating the banking industry? This morning, I took part in a fireside chat at the Goldman Sachs European Financials Conference. We discussed the potential for technology to lower costs and raise productivity. How can technology help drive down bank IT costs? 1. Reducing hardware and software maintenance costs. Modern systems are better architected, with broader capabilities, than the legacy systems they replace, helping to consolidate the number of software applications banks run whilst reducing infrastructure overheads. 5. Better risk management and operational control. Modern systems have very robust workflows, to ensure segregation of duties for example, or to keep detailed audit records. They also provide comprehensive and real time information about the business to help management to make better informed and faster decisions.In terms of risk management, modern technology helps by giving better data, a greater insight into customers’ circumstances that goes way beyond standard credit checks. Can banks continue to defer technology renewal? Time is definitely running out. In another blog, I suggested that many banks were underestimating the pace of exponential change and needed to act quicker. The first is opportunity cost. Maintaining legacy systems takes up 76% of banks’ budgets, leaving little to invest in meaningful enhancements that consumers demand and that market leaders deliver. How much more efficient can banks become with IT renewal? Temenos produces a report every year with Deloitte that compares KPIs of banks running modern core banking systems vs. those running legacy systems. It shows a significant and sustained differential in performance (a 6.5pp lower cost to income on average over a 5 year period). Obviously, the report can’t establish causation, but the correlation is extremely strong (it holds across every year, every region, every type of bank, etc) and certainly this kind of differential in performance is representative of the cases where we can prove causation. Is IT cost/total cost still a meaningful efficiency metric? In future, people will focus much less on IT costs relative to total costs. As the industry digitizes, IT costs will necessarily rise relative to other costs. Technology will become an even more important source of competitive advantage and a higher ratio of IT costs to total costs might even come to be seen as a good thing. Instead, people will focus more on where IT costs are invested. Investors, management and other stakeholders will concentrate on KPIs like how much of a bank’s IT budget is spent maintaining systems vs. developing or acquiring new capabilities. Will banks be able to realize significant savings themselves or will they rely more on third parties? Banks can realise massive savings by adopting modern third-party systems, irrespective of how the software is deployed. However, much bigger savings can be made if banks use shared infrastructure. A recent report by IDC looking at Microsoft SQL found that it was over 50% less expensive to run the database in the Azure cloud. Therefore, more and more banks will turn to the cloud. Not necessarily the public cloud but private and community clouds in order to take advantage of lower costs; they’ll be obliged to as significant parts of the banking value chain commoditise, forcing transactions to be processed at the lowest unit costs. Nonetheless, we don’t predict a more significant move to bureaus and business process outsourcers because this would entail banks giving up too much of their capability to differentiate in the front office; to launch new products quickly, to differentiate their channel experience, etc. Is technology modernization becoming less risky? Today, things have moved on quite a lot. Most systems are open i.e. they can run on most technologies, so banks can continue to leverage their existing platforms if they choose to. In addition, a lot of the big SIs like Accenture and Capgemini have built practices, so there is more expertise around mission critical banking technology. Lastly, the systems have been more and more componentized, meaning progressive renovation is now possible – replacing a bank’s IT estate bit by bit, reducing risk and time to value. Will technology displace the labour force? Some jobs in banking will inevitably be replaced by technology over time. There are many studies looking at the kinds of jobs most susceptible to automation and, unsurprisingly, many of these are in banking (tellers, for instance). But ultimately technology is an enabler. It will enable bankers to do their jobs better, with better information, fewer mistakes and better customer outcomes. For example, while there is a valuable place for roboanalyzers, they won’t replace, but empower, the best wealth managers. Do banks give adequate disclosure of IT spending? If you look through a typical bank annual report, you’ll see some information about how the bank accounts for IT costs, some information about what IT costs the bank has recognised as assets on the balance sheet, but that’s about it. Given IT costs are typically around 15% of total costs and given the growing importance of technology in establishing competitive advantage, this level of disclosure is completely inadequate. Investors and other stakeholders should be demanding much more disclosure about where the money is going, banks’ IT strategy and roadmap.